CM-700 is a control module type controller with a CPU, TTL / RS485 communication circuit and ZIG-110 connector. You cannot control dynamixels or other peripheral devices alone with the CM-700. You will need a SUB board. CM-700 SUB Board is composed of a power department, connector department, switch, and an additional circuit for 5 pin peripheral devices. 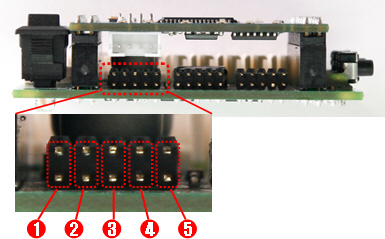 You may refer to the connector pin layout to make your own SUB board. PC Link (Serial Cable) & Communication Device Connection Port : LN-101 is used to connect the CM-700 and PC. It is used to download task code or communicate with PC. Also, it can be used for wireless communication module such as ZIG-110 etc., or communication with other external board. Battery Socket : Socket for connecting the battery. Power LED : ON and OFF LED for the power. MODE Button : Used to change the operation mode of CM-700. Please read below for more information. 3-Pin Cable Connector : Used to connect Dynamixels using 3 pin cable(TTL Communication) in a daisy chain method. 4-Pin Cable Connector : Used to connect Dynamixels using 4 pin cable (RS-485 Communication) in a daisy chain method. Peripheral Devices Connection Port : Used to connect peripheral devices such as DMS, Touch Sensor, and IR Sensor etc. Mode Display LED : LED to display current operation mode of CM-700. Detailed descriptions are provided as below. 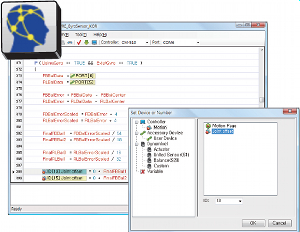 It is used to set or test the operations of CM-700 and Dynamixel using RoboPlus Manager. 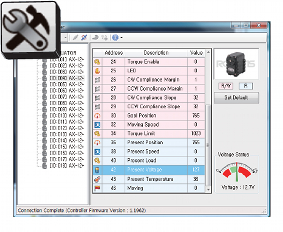 It is automatically executed when RoboPlus Manager and CM-700 are connected. 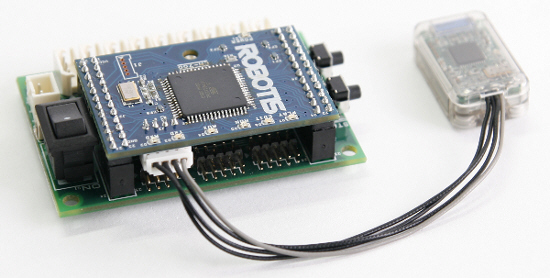 It is automatically executed when RoboPlus Motion and CM-700 are connected. It displays the task edit mode is in progress. It is used after downloading the written code to CM-700 with RoboPlus Task. Status Display LED : The LED represents the current status of CM-700. Detailed discriptions are provided as below. TxD : Turned on while CM-700 is transmitting the data to the outside. RxD : Turned on while CM-700 is receiving the data from the outside. The CM-700 which consists of a micro-controller, is divided into a power department, various connectors, and SUB board. Depending on the connection of each board, the working voltage range may change so please refer to the below information to make your own battery. Because the CM-700 does not have a regulator, the power supply from the user’s custom SUB board to the CM-700 must be 5V. 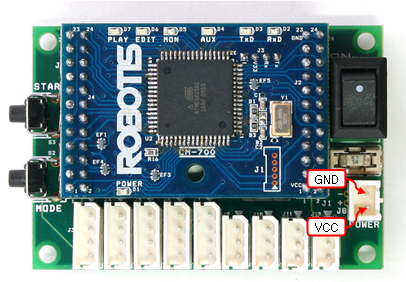 When connecting and using the CM-700 and ROBOTIS’s SUB board only, below is the allowed power range for the SUB board. Our SUB board has a comprehensive working voltage range to use all released dynamixel line-ups. Thus, the working voltage for the SUB board is restricted depending on the dynamixel you are using. When using 2 or more different types of dynamixels together, the voltage range must be where all of the dynamixels can work. Thus, the minimum voltage should be the dynamixel’s highest voltage spec and the maximum voltage should be the lowest voltage to suit the working range. For example, when using the AX-12+ and RX-64 together, AX-12+ is 7 ~ 12 V, and RX-64 is ~ 18 V. Thus the working voltage would be 12V, meaning Li-Po conversion would be 3 cells and Ni-MH would be converted in 10 cells. Connect the battery into the CM-700’s battery socket, and then set the power switch to supply power. Once the power is supplied, the POWER LED will turn on, and one of the MODE LED will start blinking. Please refer to Charging to recharge, or connect the power using SMPS. It is used to control Dynamixel and the peripherals, and it can connect Dynamixel(AX-12A, AX-18A, AX-S1, DX-Series, RX-Series EX-Series... etc.) and various parts of OLLO(Touch Sensor, LED Module, IR Sensor etc.). The controller of CM-700 can be controlled in C language. Please refer to Embedded C for more information. For the PC and CM-700 to communicate, LN-101 must be connected to CM-700 Port. ZIG-110 wireless communication module can be connected to CM-700. There is a fuse to prevent from damaging the circuit due to over current. If the CM-700 does not turn on, there is a high chance your fuse is blown. Replace the fuse right away. The pin layout of the connector which connects CM-700 and SUB board is as below. The pin composition of CM-700 power is as below. 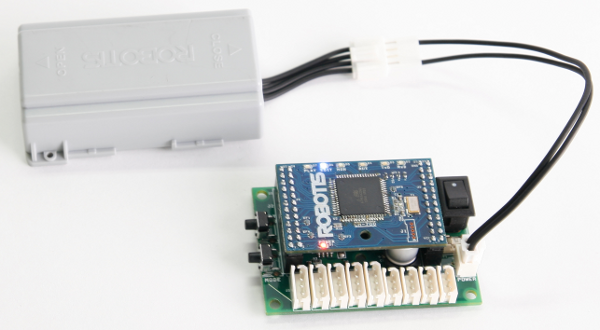 Users can create a sensor to control and connect to the 5 pin peripheral device connection port. However, composing the wrong circuits may damage your controller’s circuit, so please learn more about circuit before doing so. Below is the 5 pin layout information for a peripheral device. Below is an example of an LED circuit to turn the LED on and off using the OUT port (pin 1) . 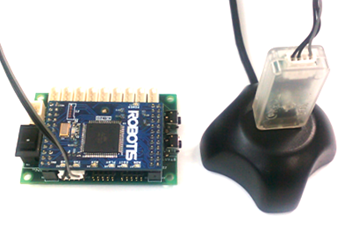 A high signal can be sent to the OUT port using RoboPlus Task. 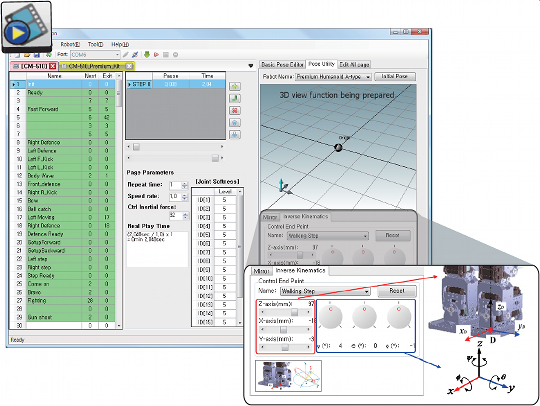 Select the user's device in the writable parameter such as LOAD and CALCULATE, then select the port on which the device is connected. Then, set the high signal to the readable parameter using a constant. 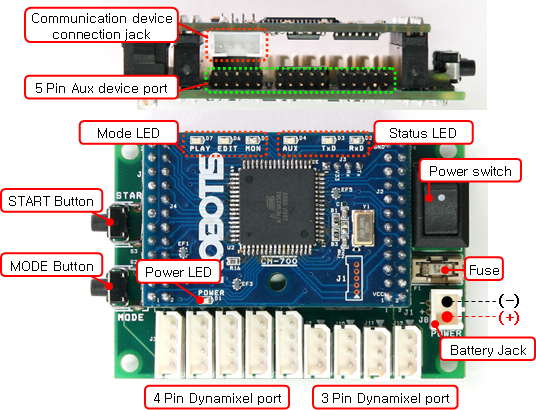 When the code above is executed, high signal will be sent to the OUT port of the device connected to PORT 3, and the LED will turn on. The functions of pins on the communication device connection port are as follows. The functions of pins on the 3-pin connector port are as follows. Pleaser refer to AX-Series Pin Assignment for more information. The functions of pins on the 4-pin connector port are as follows. Pleaser refer to RX-Series Pin Assignment for more information.